It’s time for a new challenge over at AAA Cards and we have a Tic Tac Toe grid for you this fortnight. Our sponsor is the Stamplorations shop. I decided to use the top row: gold/friendship/coloured cardbase. I rarely use coloured cardbases as I do like my white backgrounds, but I thought it would be good to do something a bit different! I used a fabulous die from Joanna Sheen and inlaid some gold glitter paper in the centre of the stars. I stamped the My Favorite Things sentiment on the reverse of a scrap of the cardstock as it was much smoother and I wanted to get a good impression for embossing. To finish off the card, I added a few small die cut stars. My teammates have shared some gorgeous CAS cards on the AAA Cards blog and we are also joined by Shery from Stamplorations and Tiya-B from Tiya-B.com. She has some fabulous creations on her blog – you must check out her site if you haven’t already done so! Life has been busy lately and I haven’t had much time to spend in my craft room but I was able to spend the whole afternoon in there today. It felt good to get back to crafting again! I missed playing along with the challenges. I decided to use the sketch for the current Freshly Made Sketches challenge as my inspiration for this card. I also knew that I wanted to use this sweet flower border die from Poppystamps and thought it would be fun to put it against a colourful background. So I got to work with distress inks, distress stains and color bursts. My hands were so inky by the end, but it was such a fun session! I chose to use a background made with color bursts – I also added some cosmic shimmer powder to this one! Love how shimmery it is! I’m also entering this into the current Simon Says Stamp Monday challenge (flower power). Hello everyone and happy happy birthday to my lovely mum who is celebrating a big birthday today! I always make a couple of cards for my mum and try to do something a bit different for one of them. This year, I decided to try an ‘impossible card’ – a fun pop up card made from a single piece of cardstock which has simply been cut in three places! I know, impossible, right? Well, it’s actually incredibly easy! I found a great video from Sam over at Mixed Up Crafts. She explained it so well that I made this at the first attempt and it didn’t take long at all. It took longer to colour that wreath! Reverse of my impossible card! Once I had the pop up base sorted, I decided to use one of my mum’s favourite dies from Memory Box and coloured it with mu Twinkling H2o paints. I stuck it to a die cut circle before adhering it to the pop up base card. I then used some old Quickutz dies for the ’70’ and voila! My first impossible card! I’m entering this into the April Memory Box challenge (flowers), the Simon Says Stamp Monday Challenge (flower power) and the Simon Says Stamp Wednesday Challenge (anything goes). I’ve had a crazy busy week with no time to get into my craft room, not even when my Simon Says Stamp order showed up! I had a bit of time this evening and here’s what I came up with using my brand new Flickering Butterflies die from Simon Says Stamp. I confess I had a little buyer’s remorse about getting this instead of a different die in the collection, but as soon as I saw it in real life, I was so happy I got it! I added a couple of layers of white cardstock to the back of the die cut piece and then adhered a panel I made with my neglected Distress Stains. I used card instead of foam as I didn’t want to raise the panel too much – It has made the card quite heavy – may be one to send in the UK rather than overseas! The Thanks die is also by SSS and the sentiment stamp is from Reverse Confetti. I’m entering this into the current Simon Says Stamp Flickr Challenge (anything goes). I loved a card the talented Debby Hughes created a few months ago with a stencil, distress ink and glimmer paste and here’s my take on it! I used an Echo Park Paper/Carta Bella stencil together with dies from Poppystamps and Winnie and Walter. I’m entering this into the current Simon Says Stamp Wednesday Challenge (sparkle and shine). It’s time for a new challenge over at AAA Cards and this fortnight’s theme is ‘perfect day’ and our sponsor is Precious Remembrance Shop. They’ve got a cool range of stamps and also some planner/scrapbooking goodies that would be perfect for Project Life. Now I must confess that I found this challenge theme incredibly difficult! I tend to think in terms of perfect moments rather than days – catching up with family and friends, seeing a new part of the world, crafting, finding a bargain, even simply my evening commuter train just running on time (yes, rare and even then rarely perfect!). In the end I decided to go with a wedding card, after all, we all want the bride and groom to have their perfect wedding day don’t we? I stamped/embossed an older Magenta stamp that I’ve had for maybe a decade. Do you think I used gold embossing powder? 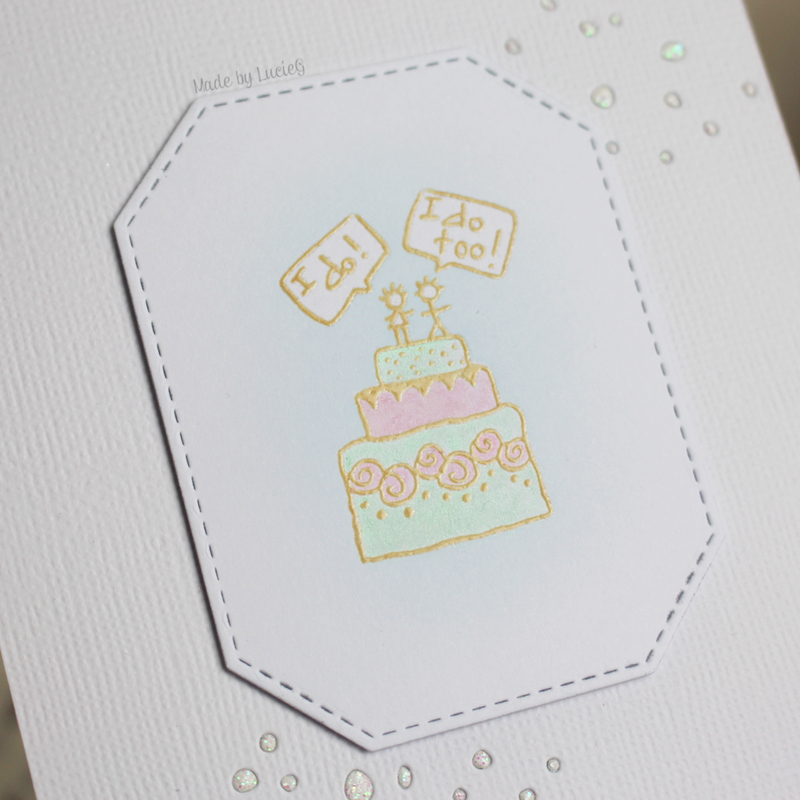 Well, actually I didn’t – I used Antique Linen Distress Oxide ink and clear embossing powder! I was pleasantly surprised to see that it looked quite golden! After colouring the image with my Twinkling H2Os, I masked it off and added some regular distress ink to ground the image. To add a bit of interest to the background, I cut a white card panel with an Avery Elle die and then inlaid some white glitter card before adhering the image panel. 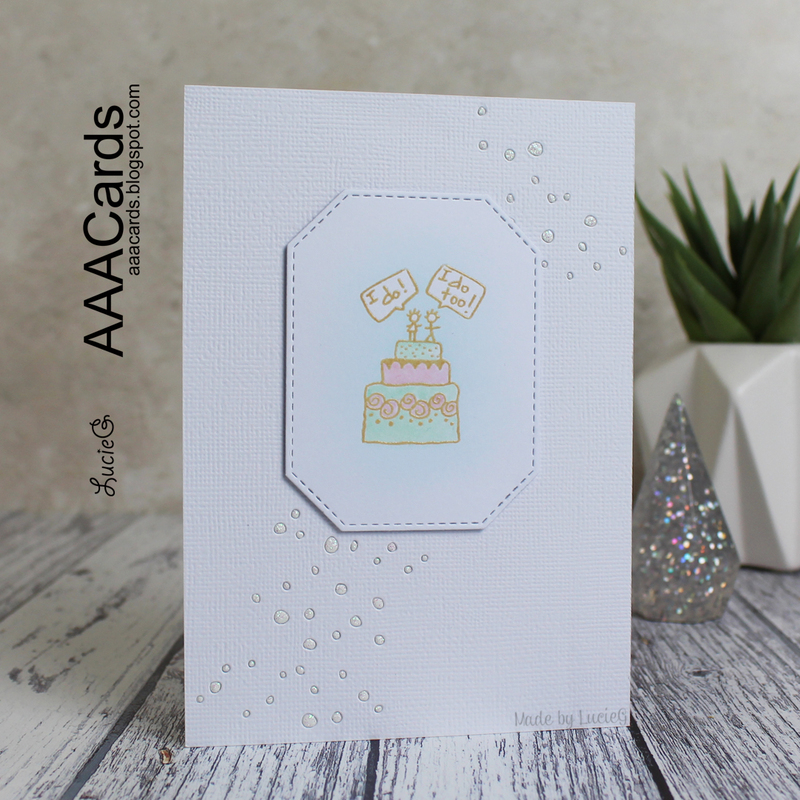 My teammates have shared some gorgeous CAS cards on the AAA Cards blog and we are also joined by Dyane from Precious Remembrance Shop and Sharon from From My Craft Desk. She has some fabulous creations on her blog – I love her style so much – you must check out her site if you haven’t already done so!